Could you explain things – how different machines work, scientific concepts, technology, the human body – using only the 1000 most commonly used words? For a start, you’d have to describe your word list as ‘the ten hundred words people use the most’, since ‘thousand’ and ‘common’ aren’t on the list (and neither is 'list' for that matter). 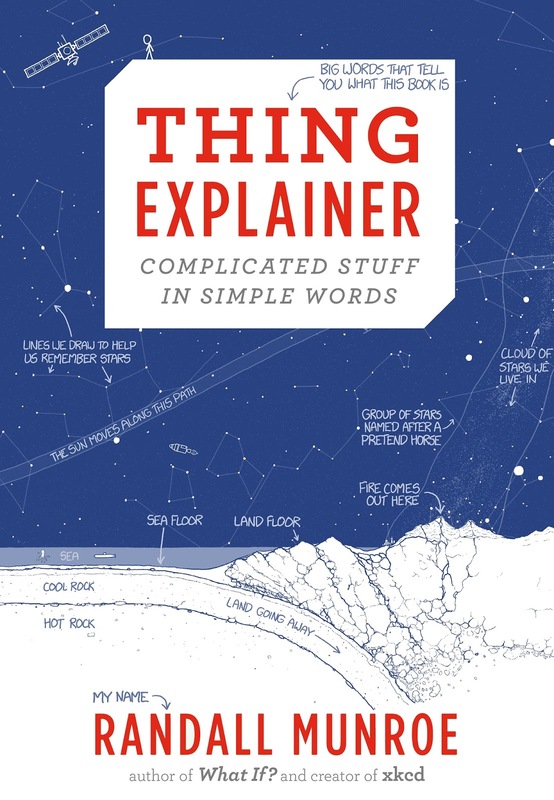 Thing Explainer: Complicated Stuff in Simple Words presents information in an accessible and interesting way for readers of all ages. 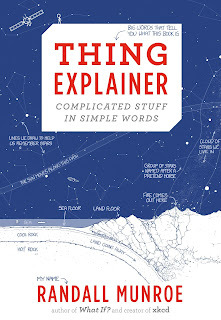 With a combination of text and labelled diagrams/illustrations, Randall Munroe (author of What if? and creator of xkcd) provides background information on a variety of topics including the ‘Shared Space House’ (International Space Station), ‘Room for Helping People’ (hospital room), ‘Shape Checker’ (padlock). ‘Boxes that Make Clothes Smell Better’ (washing machine) and ‘Sky Toucher’ (skyscraper). I’ve had this book sitting on my desk for months. Every time I go to put it away, I flick through the pages and find yet another fascinating entry that grabs my attention. With three inquisitive children who have always been intrigued by how things work, we have a large collection of great non-fiction STEM-focused books and I can honestly say that this is one of the best in our collection. From a language point of view the book is fascinating as using common, everyday words breaks down some of the barriers created by jargon and topic-specific terminology. It is interesting to realise just how much detail we can convey using a relatively simple vocabulary. While the page headings are often intriguing (‘Big Tiny Thing Hitter’, ‘US Space Team’s Up Goer Five’, ‘Tiny Bags of Water You’re Made Of’), the labels for the diagrams and illustrations are my favourite part of the book. From the ‘Bags of Death Water’ in human body cells to ‘Machines that Fight Change’ on a computer circuit board, the descriptions are wonderful. A few of the topics include fold out diagrams with an amazing amount of detail. The one I have returned to most frequently is ‘The Pieces Everything is Made of’ (periodic table) which includes labels such as red water, smelly yellow rocks, metal put in food cans to keep water from making holes in them, rock that makes glass blue, and metal we put on car parts to make them look like mirrors’. Thing Explainer is a clever concept executed brilliantly. It was one of my favourite children’s books of 2015 and I’m sure it will be a book that I will continue to return to frequently. Highly recommended for all children, but particularly those with an existing interest in STEM (science, technology, engineering, mathematics) topics.